Last night, I watched the French Open men’s finals at the Cebu Country Club with my best friend in tennis… Macky Michael. 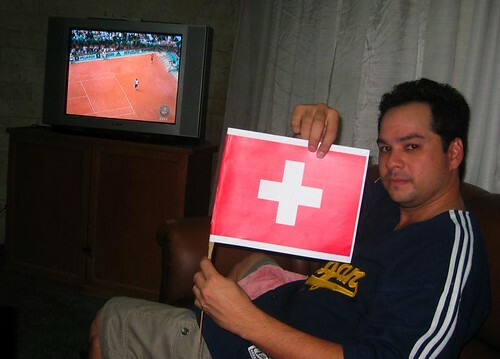 He rooted for Roger; I wished Rafa would win his third.Macky brought along an unexpected gift: the Swiss flag. He waved it as he entered the room and declared that tonight is the night for the Federer Express. During the first set, Roger had opportunity after opportunity. 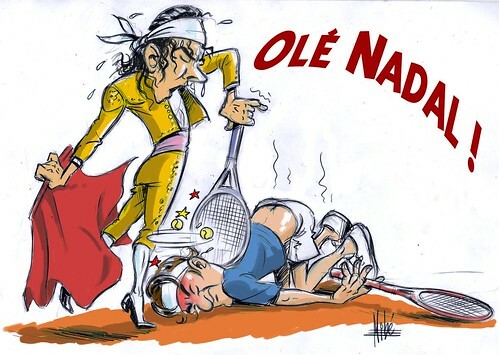 Nadal was down three break points, he saved them. Nadal was down another five break points, he saved them. When the first set finished with Nadal winning 6-3, we sat perplexed. Didn’t Federer just “waste” 10 break point chances? He did. Sayang. When the match conluded nearly 1 a.m. (RP time), that’s the word to best describe this loss to Roger: Sayang. In all, he finished with 16 unconverted break point chances. Had he converted those… we never know. The world today might be shouting the words: ROGER SLAM!